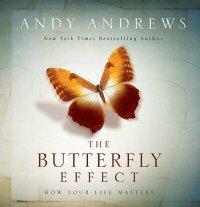 When I read Andy Andrews' "The Butterfly Effect: How Your Life Matters" it challenged me and inspired me with the historical information about a hypothesis made in 1966 that became popularly known as ‘the butterfly effect’ and how this has been proven scientifically and historically. The stories which include important events in America’s history and individuals who changed the world through their contributions to each other’s lives are eye-opening. I enjoyed reading the book because it was so easy to read (I actually read it in one sitting) and the pages are so colorfully designed that will get one who easily gets bored with historical facts to continue turning the pages. I also like how this book can challenge anyone to consider everything in life and how it can make a difference in others and the whole world. This book inspired me to look at the bigger picture of things. I would recommend "The Butterfly Effect: How Your Life Matters" by Andy as a quick read. Disclosure: I received this book from Thomas Nelson Publishing for review purposes. I was not required to write a positive review. The opinions I have expressed are my own. This book was absolutely amazing. I am intrigued with what is called The Butterfly Effect. If you have seen the movie then you kind of know what it is. If not, basically it is when any form of matter makes one move, it can change the life of everyone. The book goes into detail of examples that prove this to be true. It is amazing how one move by one person years and years ago can effect my life today at this very moment. It is a very inspiring book that tells you that you do matter. If you are going through something and are wondering why you are even alive then this book is for you, or maybe if you just want to be inspired then this book is for you too. Add a Venue in Foursquare!